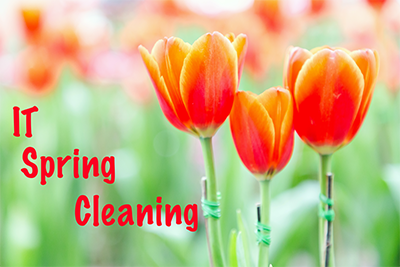 Join IT@Cornell as we celebrate our first #ITSpringCleaning month. Throughout the month of April, we will provide tips and reminders on how to keep your tech clean, safe, and functioning well. During the first week we will focus on deleting old, unwanted items from devices as well as disabling file sharing software, and keeping files and emails organized. During the rest of the month we’ll explore topics like how to keep your technology safe, how to keep your technology running at peak condition, and then in celebration of Earth Day, we’ll give tips and resources for recycling old devices. To follow along with the Spring Cleaning campaign, make sure you like us on Facebook and follow us on Twitter with #ITSpringCleaning all month long. Weekly updates will be posted on Facebook with helpful links and a general overview of that week’s topics. Our Twitter account will have daily posts with links to various online resources and also address a multitude of related topics each week. Make sure you like and follow before April! You won’t want to miss this #ITSpringCleaning.